If the startup object is not set as shown in the screen cap above, click the “Startup object” drop-down and select the desired startup object from the list. But what happens if there are no objects in the drop down and the only option is “(not set)”? First, some quick background. 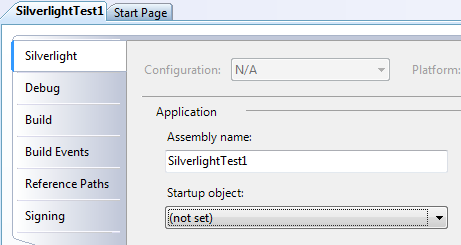 When a Silverlight application launches, it constructs the specified “Startup object,” which must inherit from the System.Windows.Application class. By default, the startup object is defined in the App.xaml.cs file, which is automatically generated when you create a new Silverlight application project in Visual Studio. The startup object setting may be lost if you rename the startup object or change its namespace. But if no startup objects appear in the drop-down list, make sure you have defined a class in your Silverlight project that inherits from System.Windows.Application.